Ultimate Dominoes Game Review - Download and Play Free Version! Enjoy Five Versions of Dominoes, Plus You Always Have an Opponent to Play Against! 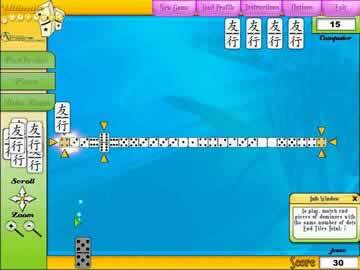 5 types of domino games. Great explanations of the rules and objectives of the game. Multiple tile designs adds a small but interesting element. No multiplayer or online mode, limiting the game. One difficulty setting makes the game less accessible for younger players. 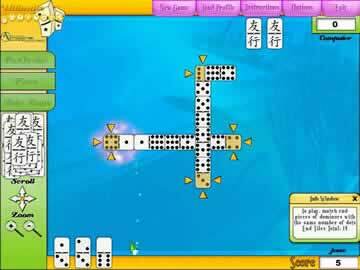 Enjoy five great domino games in one place! This is the ultimate dominoes experience! Choose from 10 domino backs and even upload your own background. 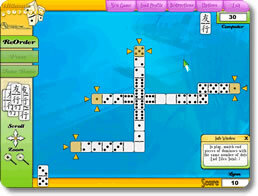 Then choose from five domino games and get playing. Three versions give you extra points for getting the highlighted dominoes to add up to multiples of five or three. Also play original dominoes and spiral dominoes, which is more challenging because you only have one number to match your domino to at a time. This game is great for gamers of any age or skill level! Helpful instructions will teach new gamers quickly, so even kids can enjoy this game. Older domino players will enjoy having an opponent to play against anytime and teaching younger gamers. If you're looking for a pack of great domino games in one place then Ultimate Dominoes is perfect for you! Ultimate Dominoes is a great tile placing game that contains 5 game types, fulfilling all of your domino needs. This game, which is a complete domino game, is a great for both advanced and beginning players. More advanced players will quickly be able to pick the game up and get started, while beginners will find the thorough instruction manual helpful, making understanding the intricacies of the game simple. So there's more to the game dominoes than just lining them up next to each other and watching them fall, each taking out the next in order. Yes, dominoes is also a challenging and casual tile placing game. This game for those of you unfamiliar is relatively simple. Each of the pieces are divided in half with dots on both ends. The ends in a traditional game are dotted zero to six. To play, place dominoes end to end, matching pieces with the same number or dots (technically referred to as pips). In a classic “5” game you score points by placing your dominoes so that the playable ends add up to any multiple of five. The game is started with the player with the highest double (the domino with the same number of pips on each side), and that tile is referred to as the spinner. The game also takes place in rounds and is played to one hundred points. Scoring is relatively simple and you can earn points in two ways. First, you earn points from your pips adding to a multiple of five. If there are three exposed tiles (playable areas) each being a five, the player who placed the last tile would receive 15 points. The second way to score points takes place at the end of the round. The player to finish the round first, placing all of his or her tiles, receives a point for each pip remaining in the opponents tiles. For example, if your opponent had one tile left that was a 4 and a 3, you'd earn seven additional points. Points are awarded until the final score of 100 is reached. This could take many rounds or could be finished in the first, depending on how the tiles are laid. One of the best features of the game are the five varying game modes you have at your disposal. There is of course the traditional 6 pip game that has you playing to multiples of five, which is mentioned above, along with a 9 pip game, a 6 pip game played to multiples of three, Spiral, and Block. The gameplay for both the 9 pip and 6 pip game to multiples of three are played the same as the traditional 6 pip game played to multiples of 5. The block game is relatively simple and much better for beginners and younger players, less able in math. In the block game each player takes turns placing their tiles. Points aren't calculated and the goal is of the game is to be the first to place all your tiles. Spiral is similar to the Block mode, expect in this mode the tile must be placed in a spiral pattern. This leaves only one place to place tiles, so draws are much more common in this mode. These variations on the traditional game make dominoes more accessible to a greater range of people. Not having an online mode or other multiplayer outlet is the major flaw of this game. Playing against the computer can only be so much fun, so having the option of playing another actual person would have been great. Opening this game to the internet with online capabilities would make this game much more accessible and more addicting. Not having this feature is the game's major flaw. Overall, Ultimate Dominoes is a fun game that is relatively unique in the board game genre. There aren't too many titles that explore the game of dominoes and this one does so in a successful manner. Despite not having online capabilities this game remains fun, especially for a casual player. If you are a fan of the classic tile game, have heard of it and don't know how to play, or are just someone looking to kill some time over dotted tiles, this title is for you.